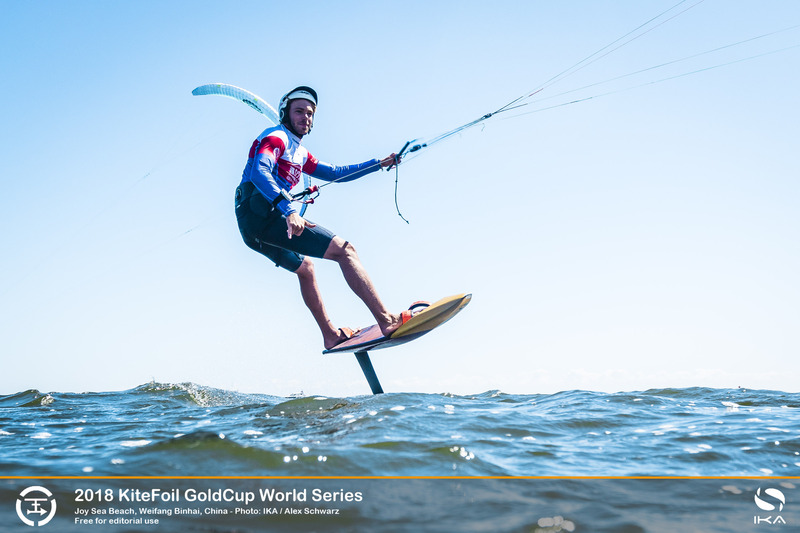 Monaco’s Maxime Nocher surged to the head of the order at the KiteFoil World Series’ opening act in China, taking four wins from seven on the competition’s penultimate day that was packed with drama that proved costly for his rivals. 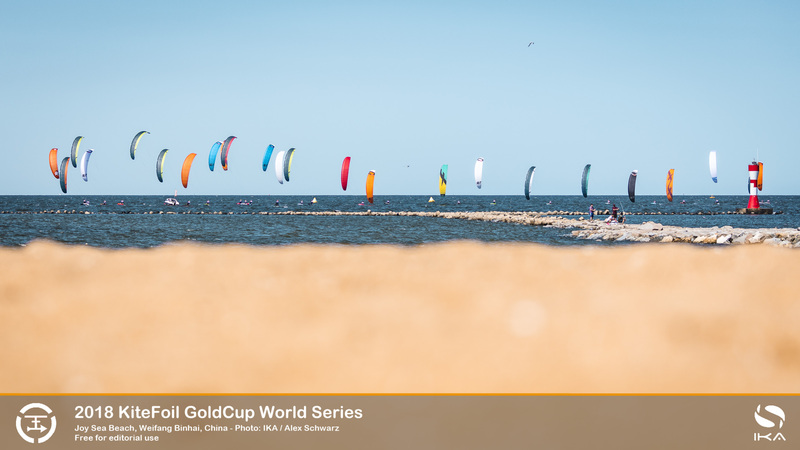 But the multiple world champion was a model of searingly-quick consistency even up against one of the fastest fleets that has ever gathered to battle for the unprecedented €60,000 prize money on the Yellow Sea track off Weifang Binhai, eastern China. By contrast, the leader for the opening three of the regatta’s five days, Britain’s Connor Bainbridge, slipped to second overall after a slightly mixed outing in perfect kitefoil racing conditions with breezes that ranged from 13kts to 19kts under clear skies. The Briton, along fellow countryman Guy Bridge, felt they had lost their focus partly as a result of one of the more bizarre incidents to befall kitefoil racing that occurred in day four’s opening exchange. 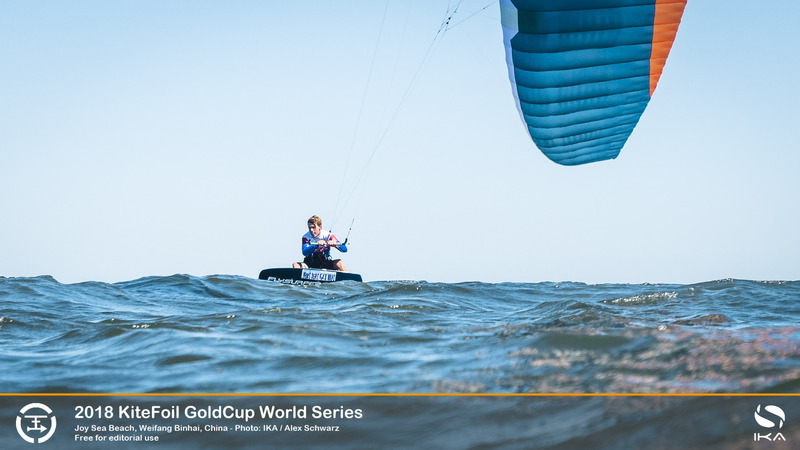 As the pair battled neck-and-neck for the lead on the second upwind leg, both racers’ kites were taken out the air by the downwash from a Chinese maritime rescue helicopter that had been hovering low over course, apparently watching the proceedings. Both crashed and Bainbridge in particular had difficulty relaunching his kite. Both eventually finished the race down the order, but on appeal were given redress and average points for the race that helps keep them in contention for a podium finish. Champion, France’s Nico Parlier, who now sits third overall. Bridge’s disqualification cost him the leaderboard top spot that he briefly held during the day. Some ill-luck afterwards when he hit debris and crashed several times while battling for the lead put him down to fourth overall. The constant trading of positions at the head of the fleet is a reflection of the mounting pressure and the stratospheric level at the first of the four-stop International Kiteboarding Association (IKA) KiteFoil tour that will crown the best overall racer as world champion. 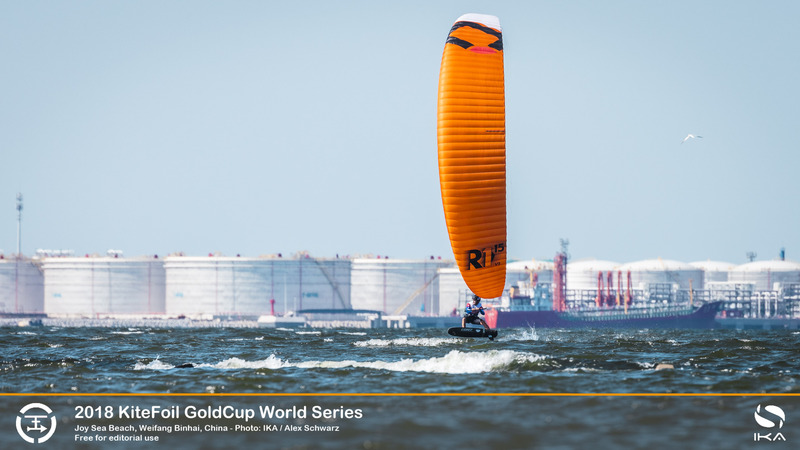 Parlier, who recently lifted his second successive Formula Kite world title in Aarhus, Denmark, has grown quicker over the competition and scored a bullet in the final race of day four. But he acknowledges he let his concentration slip after he was crowned. Bainbridge was quite phlegmatic about his mixed day that saw the lead slip from his grasp despite a clutch of high-placed finishes that were still not enough to match his early performances. Nocher appears to be hitting his stride just as the competition reaches its climax, taking two second places along with his day’s four wins. But unlike rivals he has stayed clear of trouble and posted no poor scores that have pulled the others down.